I think I may make a few more of these. 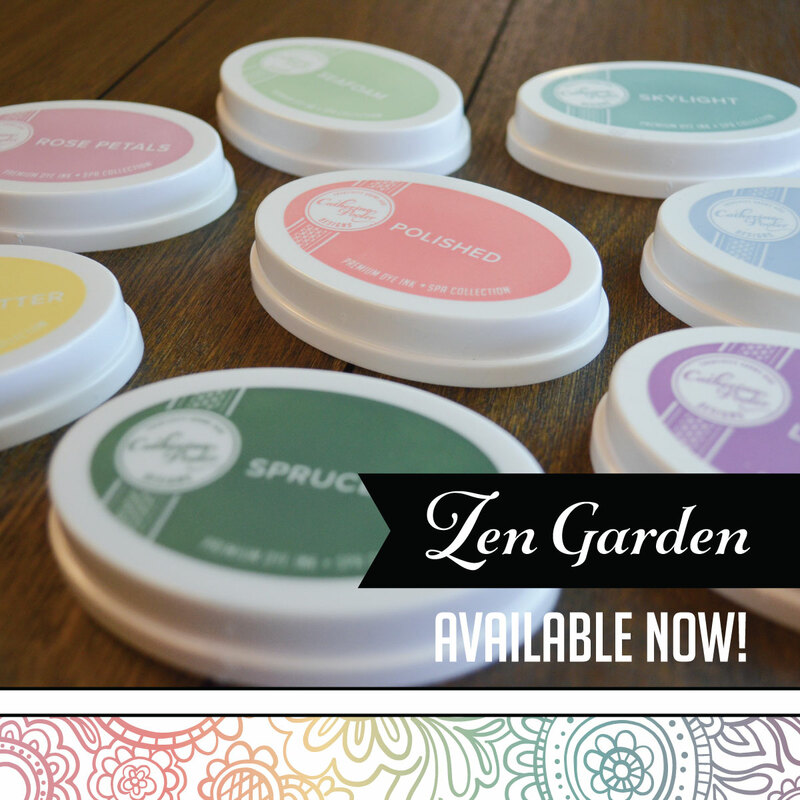 I think I'll stamp each one in a different color and make the group a set. Hello from snowy PA! We got about a foot of snow yesterday and lost power for about 12 hours. It was cold, brrr. I'm happy to be warming up with a HOT cup of coffee. Coming so soon after Irene, this was a bit much. We are hoping to get our hands on a generator so that we can at least run our pellet stove to stay warm. My card seems to fit in with the general feel here at our house. It certainly looks a lot more like Christmas than Halloween!! I used Christmas Lodge (my new favorite) to make this card for The Outlawz CAS Challenge, which happens to be Anything Goes. So head on over and link up a CAS card. Awesome monthly prizes, as always, from our generous sponsors. 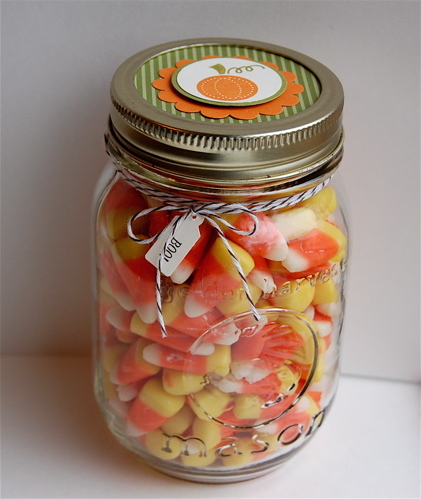 I filled a jar with candy corn and had the children guess how many. The guesses ranged from 7-5,000, LOL!!! The closest guess was 105 and the lucky winner took home the jar. I decorated it using the Button Buddies & Tiny Tags Stamp Sets. Ethan and I made these cute little ghost cookies using Milano cookies, white chocolate melting chips and mini chocolate chip. Adorable, right? 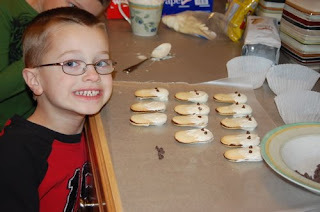 We also made a ghost craft that the children loved, but I don't have any pictures of those. I should get a chance to get back to my stamp room today. Hopefully I'll be back with a card soon! Of all of the new products in the SU! Holiday Mini, the Frostwood Lodge Suite is my favorite! I love the woodsy/outdoorsy feel of the entire line. 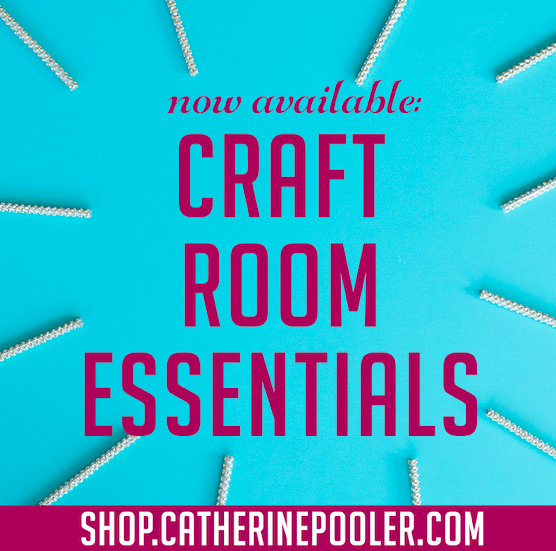 It's perfect for scrapbooking too, especially for boy pages, camping, hiking...just about everything we do!!! 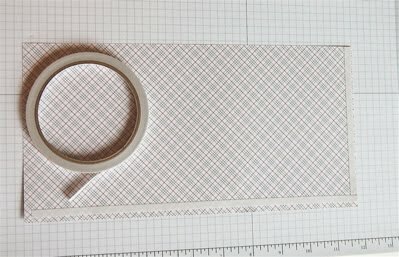 The Frostwood Lodge dsp is perfect for cards too, even the larger scale plaids, like the one I used here, works wonderfully. 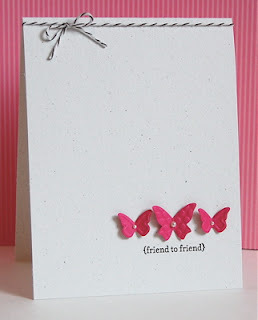 This is a fabulous card to mass produce, you could whip up a bunch of these in no time at all!!! Speaking of easy to mass produce cards, today was the kick off of the StampNation Holiday Card Series. 12 videos on mass-producible cards AND cards with a bit more "oooomph" are coming to SN. 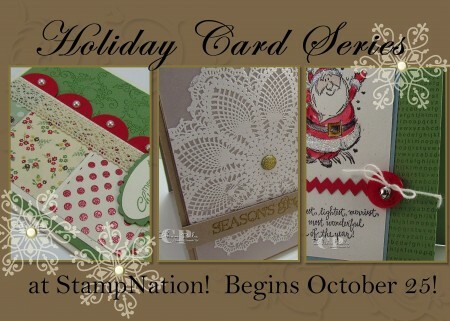 Click here to join StampNation now, you don't want to miss this. 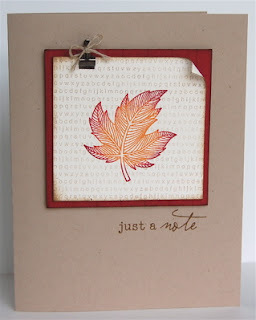 I'm checking in this morning with this weeks CAS Challenge at The Outlawz; to use a leaf as your focal point. 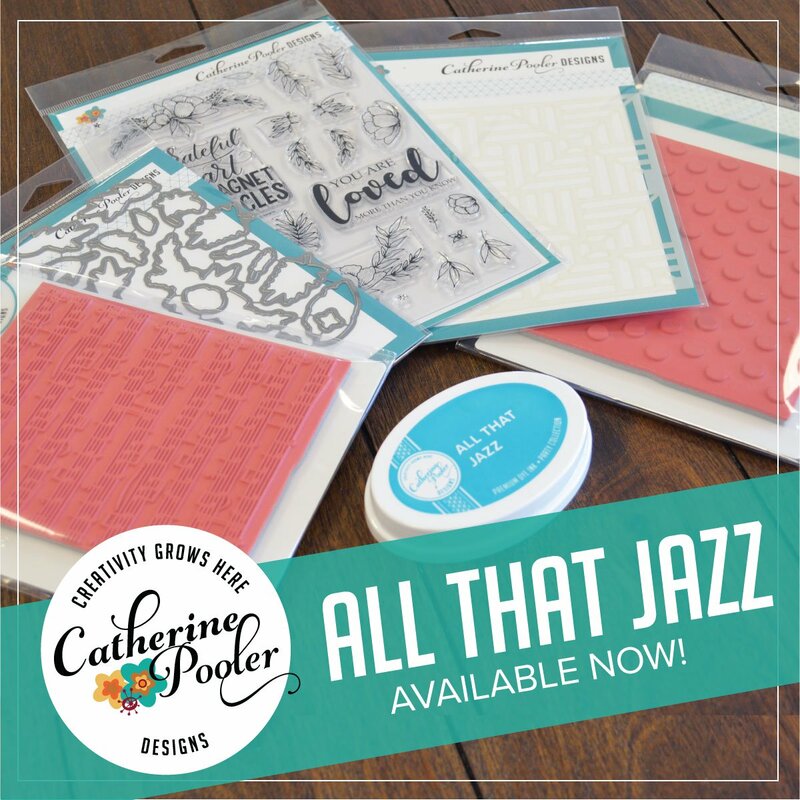 To make my card, I first stamped the A to Z stamp in Crumb Cake ink. Then I inked a leaf from Autumn Splendor, first in Pumpkin Pie ink and then rolled it in Cherry Cobbler. I added some distressing with Soft Suede ink. For a little more interest, I curled the top right corner. 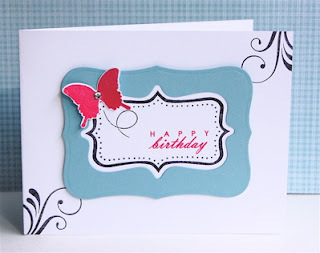 I started with a Naturals White cardbase and 3 Mambo Melon Beautiful Wings Embosslit butterflies. I added a basic pearl to the center of each. Then I stamped the sentiment from Teeny Tiny Wishes. I finished off my card with some Early Espresso bakers twine. It doesn't get more simple than that!!! The layout of my card was based off of this weeks Clean & Simple Sketch (FTL163). I hope that one day our world is cancer free. Enough said. 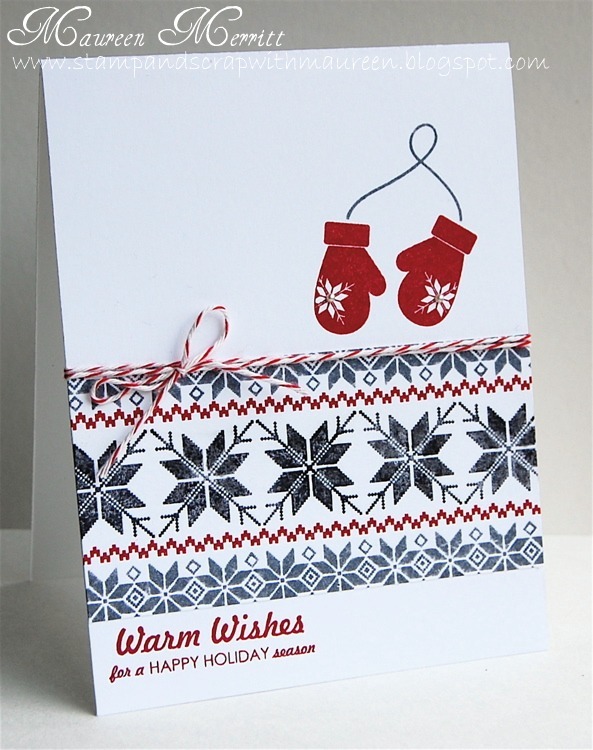 I hope you don't mind, I am taking a day off from posting holiday cards. 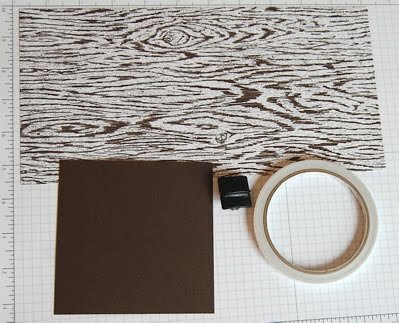 The Make-it-Monday video this week really intrigued me, I had to see what I had in my stash that I could use too make my own layered frames. 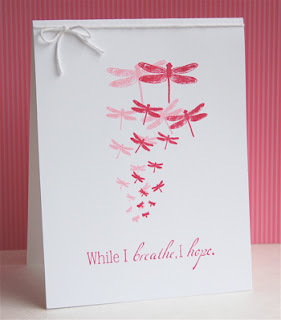 I decided on a Spellbinders Label 8 die & the Fillable Frames #4 die. I love it. The possibilities with this technique are pretty much endless. 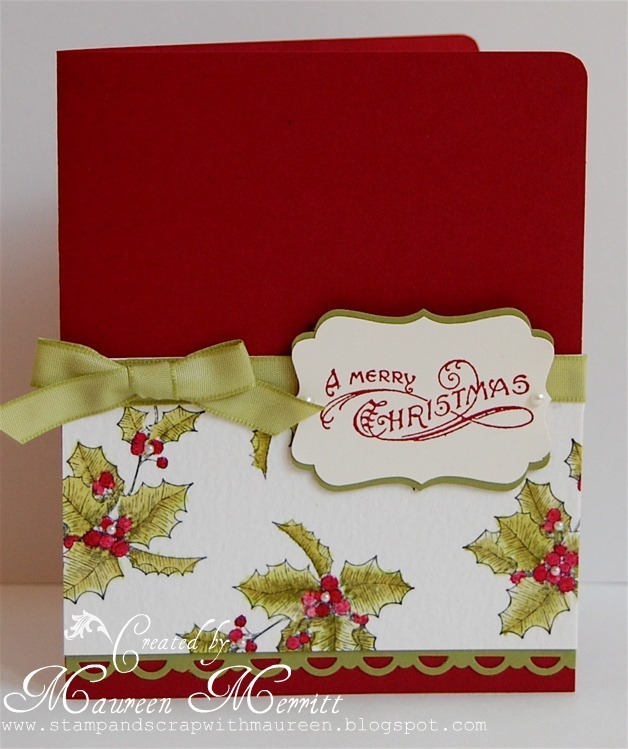 The layout of my card was inspired by CASE Study Challenge #62. 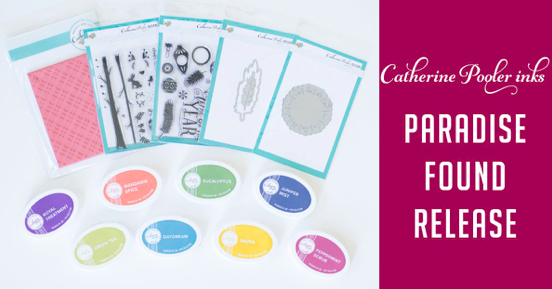 To do this, all you need is the large doily image from Delicate Doilies, some ink, removeable adhesive and a punched 1 1/4 inch circle. First, ink your doily in Old Olive ink (or ink of choice). Then, with removeable adhesive, attach the punched circle to the center of the doily. Huff and stamp! 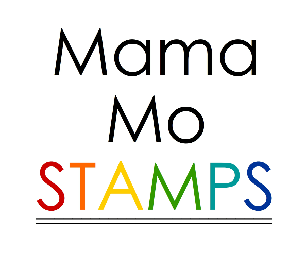 Try this with other stamps too and see what you come up with!!! Oh dear! 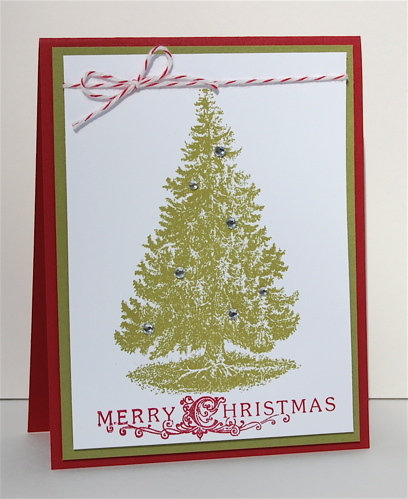 Here I went and told you on Saturday that I'd be back daily with holiday cards for the next week and I didn't post anything yesterday...bad, bad blogger! I'll TRY not to let that happen again! 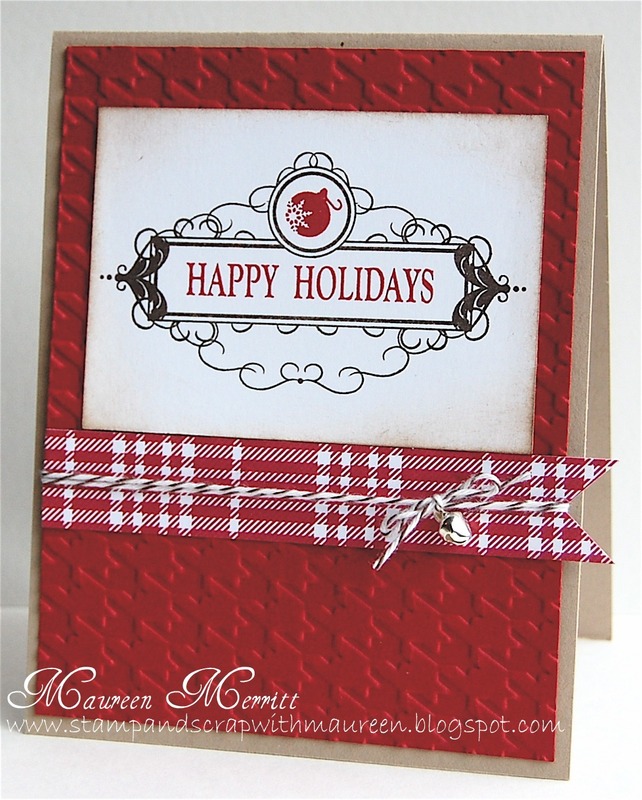 I have for you today a card I made for this weeks CAS Challenge at The Outlawz: Make a monochromatic holiday card. I used shades of blue: Baja Breeze, Marina Mist & Not Quite Navy and made this holiday card. It's perfect for friends that may not celebrate Christmas. Come on over and join us! I'd love to see your CAS Holiday creations! I have been having a blast with this Bells & Boughs stamp set that my friend loaned me last week! I love the timeless images. For my first card, I went with a vintage feel. I love combining the music notes wheel with my holiday images!!! 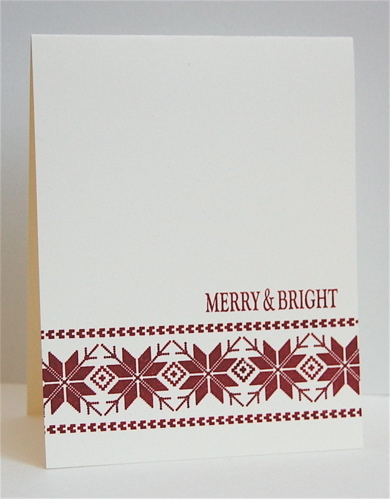 I used the square lattice embossing folder and some dazzling diamonds to add a little sparkle to this beauty! For my next card, I stayed more traditional using Old Olive and Cherry Cobbler paper & ink. It was a bit time consuming since I watercolored my images, but it can easily be transformed into a quick & easy card to mass produce by adding a strip of dsp instead! Another holiday card tomorrow, see you then! Have you noticed me switching gears from Autumn to Christmas? I am totally in the holiday card making spirit. 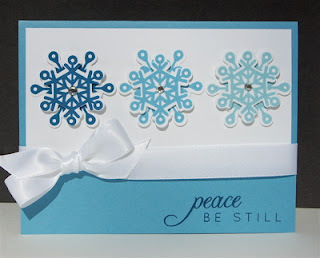 JUST card making, I can wait for everything else that goes along with the holidays. 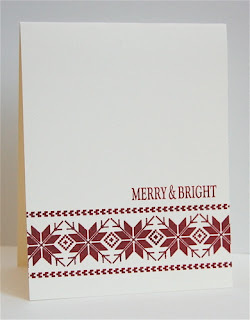 I'm using another stamp set that I won from wplus9, "Christmas Wishes". 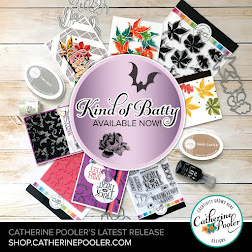 The label stamp is simply gorgeous and comes with interchangeable sentiments and decorations. I love the versatility!!! Did you see the mini jungle bell? Love them, they even ring!!! Fun, right?! Want to see more? 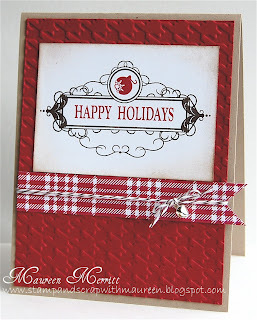 I'll be back with holiday cards daily through next week, woohoo! (The weather here is terrible, I'll add a new picture when the sun returns! As I mentioned yesterday, I won the entire October Release from WPlus9. Woohoo!! While (im)patiently awaiting the arrival of my new stamps, I came across this gorgeous dress in the Hanna Andersson catalog. It spoke to me & immediately started my mojo flowing again! One of the stamps I won happened to be a Fair Isle Background set. I knew exactly what I was going to do with the stamps when they arrived. I LOVE building my own backgrounds and this set is no different! 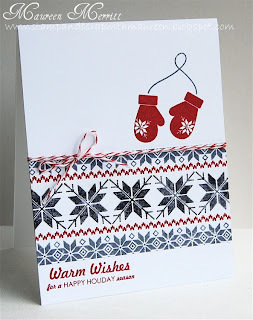 Inspired by the above photo, I paired the Fair Isle Backgrounds in Basic Gray, Basic Black and Cherry Cobbler with mittens & a sentiment from Winter Wishes to make my card. 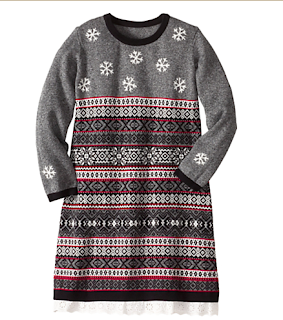 I love it, it makes we want to snuggle up and drink hot cocoa! Thank you Dawn for the stamps! They most definitely played a HUGE part in getting my creativity flowing again!!! But, first things first...I can't believe I forgot to post this card! 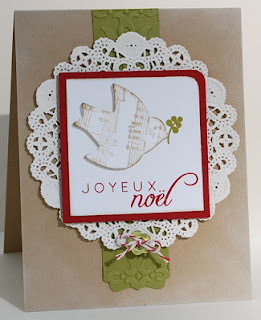 It's for the CAS Challenge at The Outlawz: Use your favorite stamp to make a CAS card!!!! Hmm, I don't have a favorite stamp. My favorites change by the season, month, week, sometimes daily...but lately I've been LOVING Autumn Splendor & Perfectly Penned, so I decided on them. Do you have a favorite? A stamp you've been inking up a lot lately? Then head over to The Outlawz and play along! Congratulations Syd! 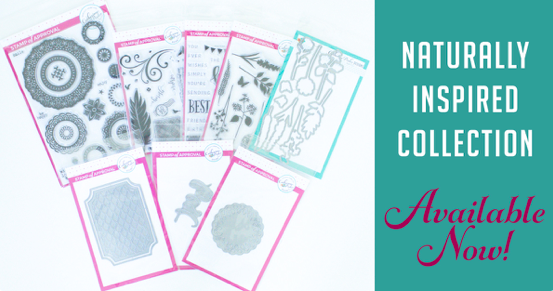 You won the Faith in Nature stamp set!!! Please email me your snail mail address so i can send you some happy mail!!! I'm having a bit of an issue here, it's called "lack of mojo". 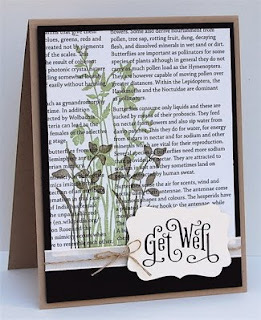 I have been quite busy for the past couple of weeks while battling 2 different illnesses. I spent the majority of last week trying desperately to catch up on housework. In the mean time, I was left with NO stamping time. I spent a couple of hours last night and some time today trying to get my mojo back. 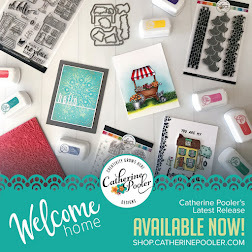 I don't think I've found it just yet :( I turned to the Clean & Simple Stamping Blog for some inspiration and I'm afraid my card has fallen flat!!! I'm going to keep my chin up and keep at it, I know eventually it will return. I just hope it's sooner, rather than later! Hi, thank you for visiting me today. I hope you are having a fabulous week. Let me just tell you, I am SO happy tomorrow is Friday!!!! 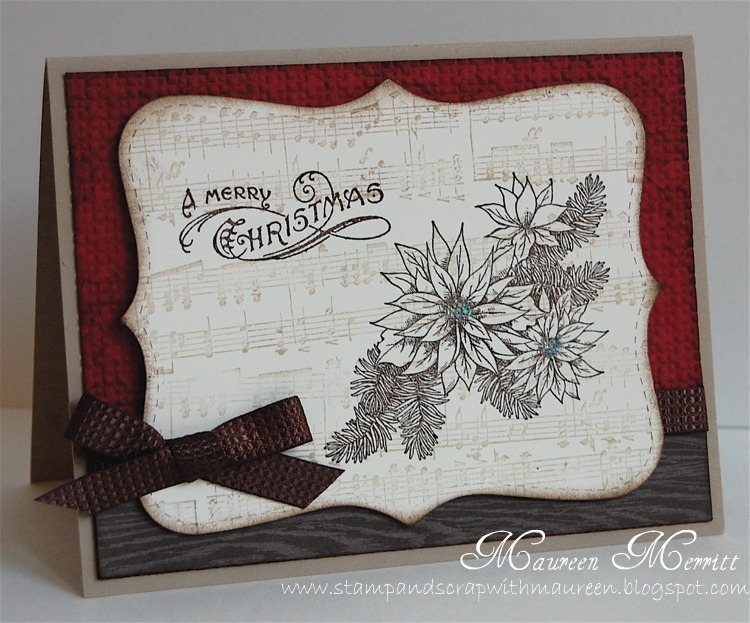 My card today was inspired by the SCS CAS Sketch Challenge this week (CAS138). I did a bit of flipping and adjusting to make it fit my design. I'm actually wondering if I went beyond CAS. There are quite a few layers here. 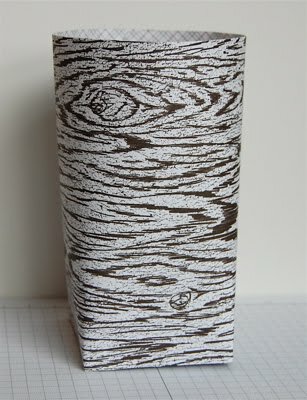 It is uncluttered with a clear focal point, hmm...what do you think? I have to say, I bought this stamp set almost a year ago and this is the first card I have made with it that I actually like. I saw a card recently where a die cut tree was stamped with music notes and thought I'd try it on the dove from this set. I LOVE it! Don't forget about The Outlawz 1000 member party & Blog Hop, there are still a few more days to join!!! **If you are here for The Outlawz Blog Hop, scroll down! 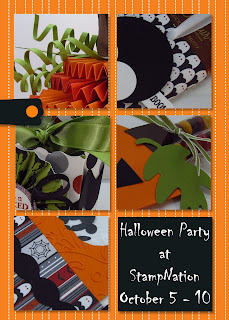 Today I'm sharing a card I made for the latest challenge posted at StampNation, to be inspired by Fall. That leaves the playing field wide open, right?! I love Fall, the foliage mostly and the overall feeling of the season as we prepare to be thankful for our blessings. So, that is the direction I chose to go in. I used the Day of Gratitude stamp set to make a CAS (almost OL) card. I started by stamping the largest image in Crumb Cake on my Very Vanilla card base. 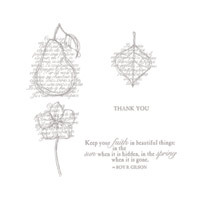 Then I stamped two leaf images, one in Soft Suede and the other in Pumpkin Pie (even the names sound like Thanksgiving :) on a scrap of Very Vanilla Cardstock. I trimmed them out and adhered them to the card. I added a 1/2 inch strip of Soft Suede cardstock, as well as a button, to the left side of the card to create better balance and flow! 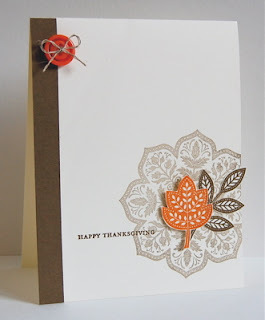 Lastly, I stamped my "Happy Thanksgiving" from the Teeny Tiny Wishes set in Soft Suede ink. Welcome to The Outlawz 1000 Member Party Blog Hop!!! We have quite a line-up for you filled with great tutorials! The Design Team has been busy! Today we present to you techniques and awesome inspirations! Be sure to comment on all of the blogs along the way to be eligible for 9, yes 9, prizes! Each blog is giving away a prize and one random grand prize will be drawn at The Outlawz for those of you who have commented on every blog and entered your name into Inlinkz here. There are also 7 challenges posted for the party!!! Each challenge will be open for one week and each challenge has FOUR prizes!!!!! Don't we have awesome sponsors!!! Good luck and see you at the party! 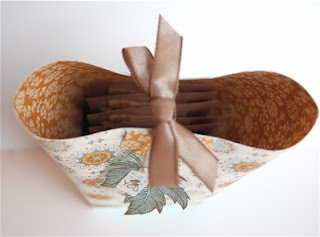 Today I am sharing with you this sweet "Box in a Bag." Adorable, right?! I filled my Box-in-a Bag with tea bags. This would make a great gift for someone who is under the weather!!! Score diagonally in each corner. 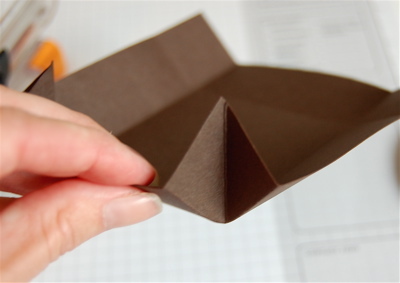 Crease on all score lines and fold corners as shown. 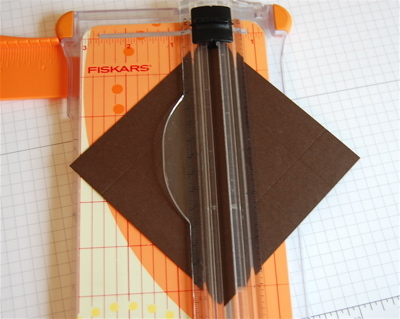 Adhere with double sided tape. Now we move on to the bag part of our project. Flip your patterned paper on to the side you do not want to see on your finished project. 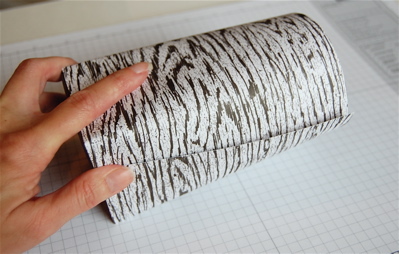 Next, line the long side & one short side with double sided tape. Remove the backing on the long side only. 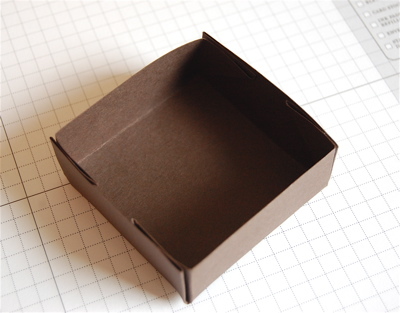 Flip the box on it's side. 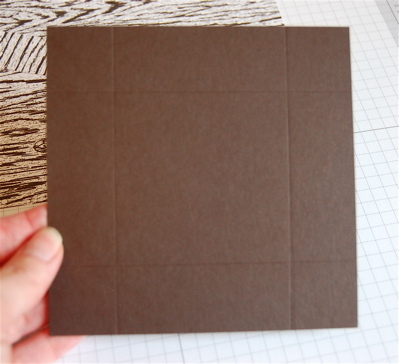 Starting with your patterned paper midway though on one side of the box, start adhering your paper to the box. 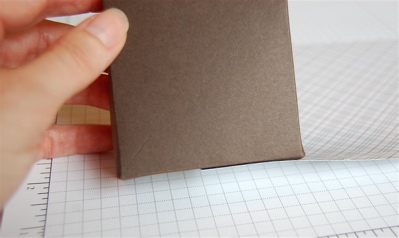 Start rolling your box while adhering the patterned paper. 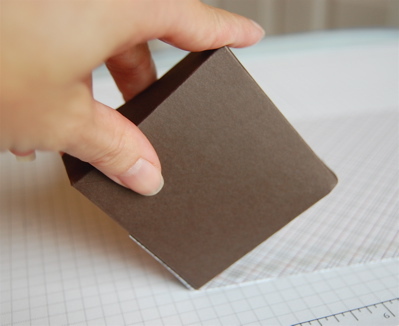 Now remove the backing on the short side of your patterned paper and adhere! Put your hand inside the bag and make sure all sides are good and secure. Your Box-in-a-Bag is now complete. 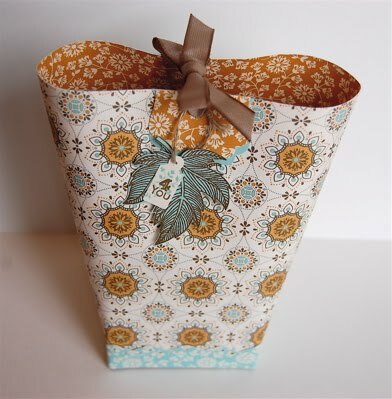 I'll be back to post this finished Box-in-a-Bag later. The ideas on how to use this Box-in-a-Bag are endless! 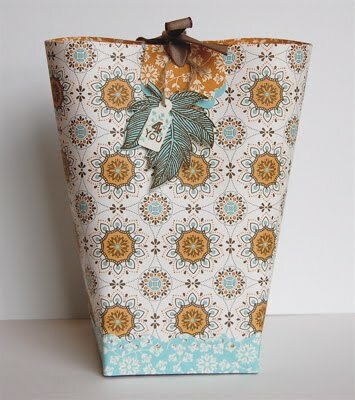 Fill it with candy, tea, coffee, 3 x 3 cards, popcorn, trail mix, tealights or votive candles, potpourri, biscotti, baby gifts...like baby socks or rolled up onsies. I hope you've enjoyed this tutorial and that you will try one of these yourself. 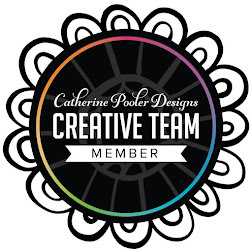 Amy Beaver, a member of The Outlawz CAS Design Team, made a sample to share with you too. Isn't this SO much fun! Perfect for Thanksgiving favors or a new neighbor!!! Don't forget to leave comments along the way!!! Comments on THIS post will be the only comments that count!!! Comments must be left by 11:59 pm on Sunday October 9th. I will be posting the winner here on Monday, October 10th!